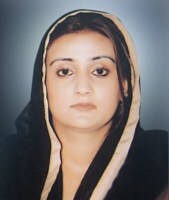 Mrs Azma Zahid Bokhari wife of Sami Ullah Khan was born on August 18, 1976 at Faisalabad. She obtained the degree of LL.B. in 2001 from Pakistan College of Law, Lahore. A practicing lawyer, who has served as Member, Provincial Assembly of the Punjab during 2002-07, 2008-13, 2013-18 and has functioned as Parliamentary Secretary for Culture & Youth Affairs during 2009-11 and Parliamentary Secretary for Information & Culture during 2013-18. She has returned to Assembly for the fourth consecutive term in general elections 2018 against one of the seats reserved for women. She also functioned as Chairperson, Standing Committee on Law & Parliamentary Affairs till 17 February 2017. She has travelled to UK, Dubai, Qatar, Iran and Turkey. She visited USA in 2011 as a Member of delegation of Indo-Pakistan Young Parliamentarians; Spain to attend Socialist International Conference; and India to attend “SAFMA” Conference. Her Husband is sitting Member Punjab Assembly.